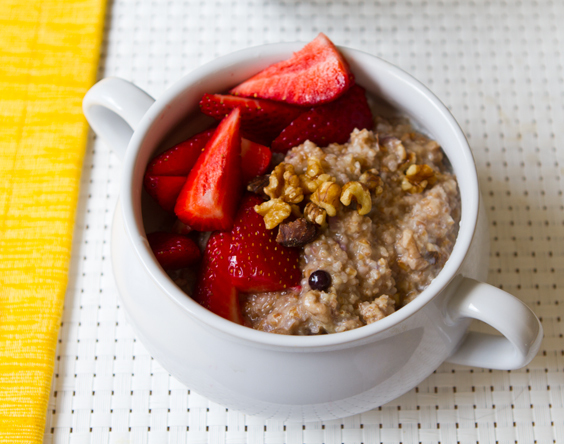 Cracked Farro Porridge with Berries and Walnuts. Nutty and rustic, silky and creamy. 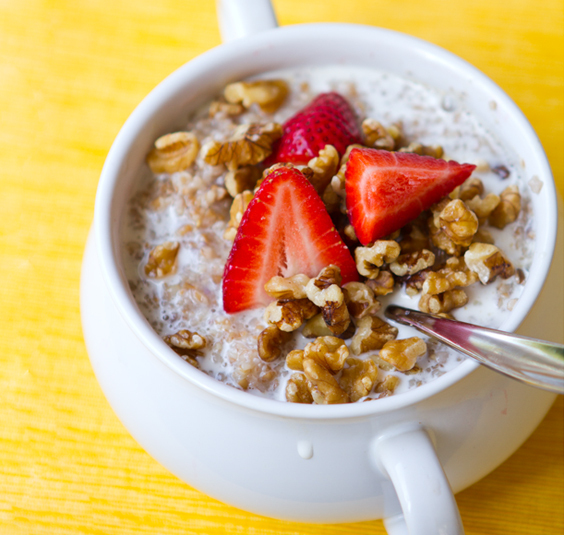 Tender grains of cracked farro mingle with juicy sweet farmer's market strawberries, raw crunchy walnuts and a splash of velvety soy creamer. A sweet hint of maple syrup, cinnamon and sea salt. So simple. So obvious. Yet so extraordinary. 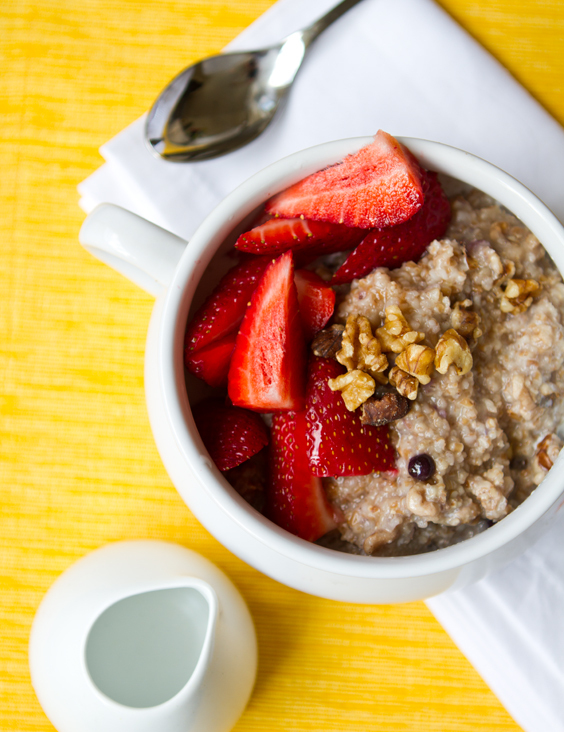 If you love a bowl of hot cereal in the morning - you must read this post and fall in love with farro! It is my favorite grain for hot cereal. Not just because of the complex, wholesome flavor - but for the nutrient properties as well. 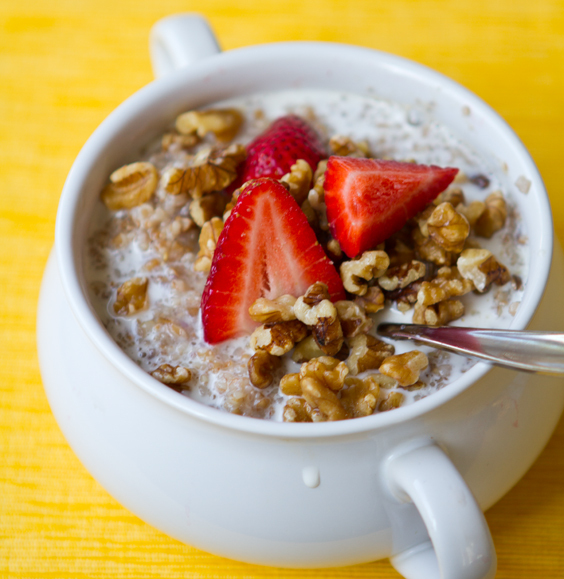 Get to know farro..
Before adding yummy toppings - just farro and soy creamer..
As I write this post, I'm learning a few new things about farro! For example, did you know that farro is also known as "emmer" wheat. Le Pain's porridge (from my Snow Day with Gena post).. Exotic Grains. I've been fascinated by exotic, "ancient" grains, like kamut, spelt, quinoa, farro, amaranth and more for a while now. 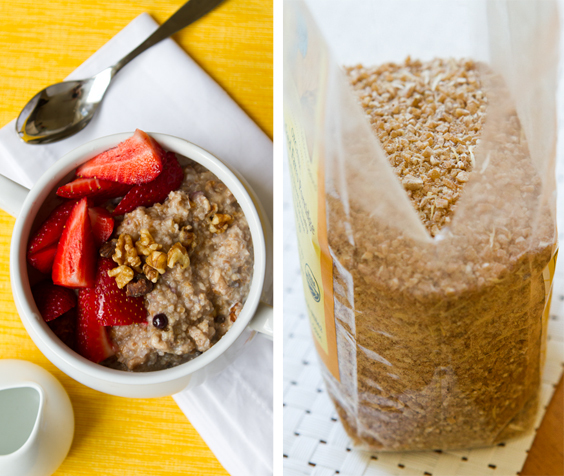 It just makes sense to want to diversify the grains I eat (away from only wheat). Diversification in a vegan diet is very important. With fruits, veggies, legumes .. everything really. Another example of diversification - how I try not to rely heavily on soy products for protein / non-dairy milk - and branch out to rice, hemp, almond and more. Also, greens. Spinach, romaine, kale, mache, watercress, sprouts, chard and many more will boost your nutrient intake by diversifying the varieties of green nutrients you take in. Grains is a smart area to diversify. And farro just happens to be a favorite of mine. 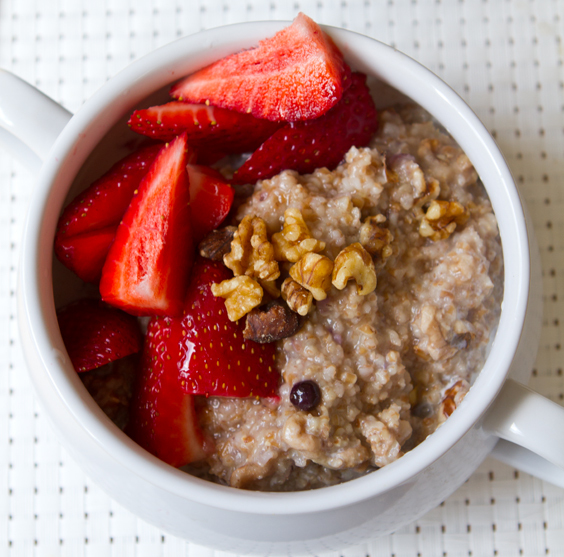 I've swooned over farro pasta, farro grain pilaf and whole grain farro porridge. 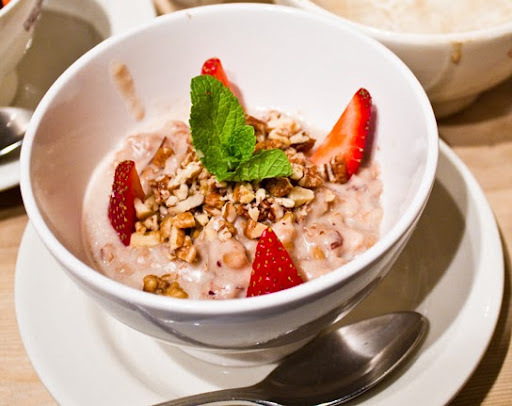 And recently, found this cracked farro porridge. Why Farro? Well simply put, it is a low-gluten and nutrient dense wheat alternative. It is higher in protein than most traditional grains. It can be used in a wide variety of savory to sweet ways. 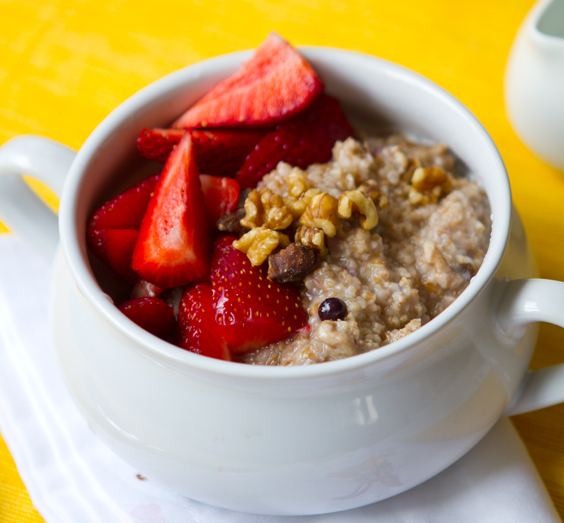 Porridge, served savory-ish in soups or as a side, farro risotto, farro pasta and more. Farro pasta with vegan pesto sauce - yum! Availability. You might not be able to find farro in your local grocery store right this second - but now that it is fresh in your mind you just may start to keep a lookout for it. You never know what specialty stores (or even mainstream stores) may carry it. I recently bought some farro linguine pasta at Williams and Sonoma! It was fantastic. And you can always buy online. 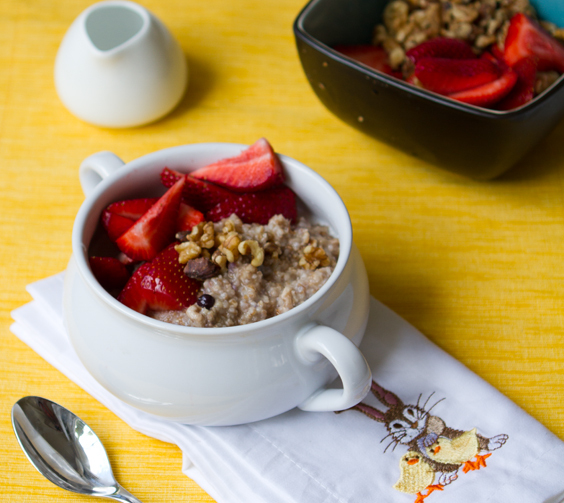 Bluebird Grain Farms, the brand I used in this recipe allows for online ordering. And I've seen other awesome brands as well. 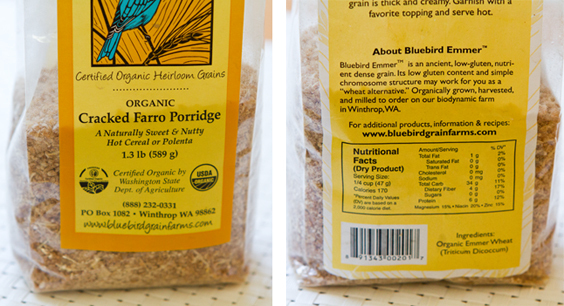 From Bluebird Grain Farms: "Emmer, known as farro in Italy, is an ancient ancestor of wheat. It is an incredibly versatile grain with a wonderfully full-bodied flavor and robust nutritional value. Emmer is high in protein—ranging up to 22%— and also low in gluten, making it a great choice for people who are sensitive to more common, hybridized types of wheat .. Our emmer is always 100% organic, produced from our own carefully cultivated seed, stored onsite, and milled to order by the family who grows it"
So once you snag some farro or cracked farro for porridge - give this recipe a whirl!.. other: additional berried, dried fruits, spices like cinnamon, vanilla..
1. Add farro to dry soup pot - over high heat. Allow grains to toast in dry pan for about a minute. Tossing around a bit. 2. Add in water and salt. 3. bring to a boil, reduce heat to low and simmer for about 15 minutes. If you simmer covered with a lid be sure to monitor closely - as farro can bubble quite rapidly - spilling over the pot. NOTE: this method is for cracked farro. Whole grain farro will take longer to cook. 4. When farro has reached a cooked consistency, add ingredients like maple syrup and spices. 5. 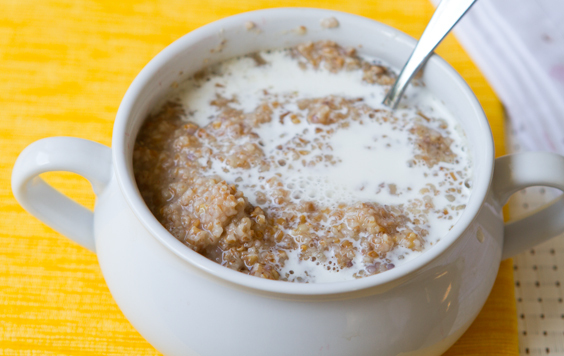 Serve in a bowl with soy milk or creamer poured over top - I like a nice amount to loosen the cooked farro. 6. 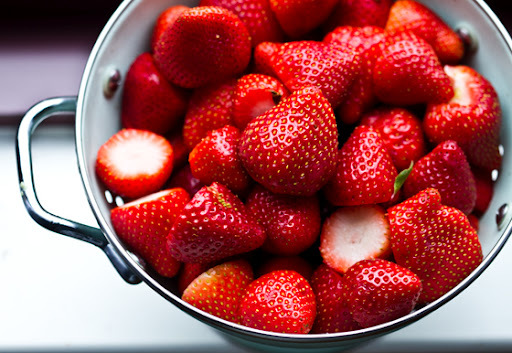 Add berries and walnuts - and anything else. Serve! Get more of my tips and info for why you should try farro - over on Babble.